One of the biggest problems that develops a marketing mistake, especially in international marketing, is translations. Pepsi - "Pepsi brings your ancestors back to life"
Pepsi are one of the big brands that suffered this marketing flaw, when trying to expand into China. Pepsi marketing campaign to penetrate the far east focused on the motto "Come alive with the Pepsi Generation" , which translated into "Pepsi Brings your ancestors back to life" . Although this may seem funny, expanding internationally is very costly, and a campaign which offers such a "bold statement" and absurd message from the view of the Chinese population could have cost Pepsi millions of pounds. This mistake is worse compared to many other campaigns that are translated internationally because of the opportunities of China's dramatically rising economy. Coors Light - "Suffer from Diarrhoea"
Coors Light, the American beer company, decided to use the slogan "Turn it loose" when advertising its product in Spain. Unfortunately for Coors, the translation of their popular slogan in Spanish meant "Suffer from Diarrhoea". Slightly more hilarious than the Pepsi mishap, the Coors Light slogan could have potentially damaged their reputation in Spain, especially when comparing a consumable good as something that will potentially make you "Suffer from Diarrhoea"
KFC- Finger licking good, or eat your fingers off? The final brand that will be covered in this marketing mistakes post will be Kentucky Fried Chicken. 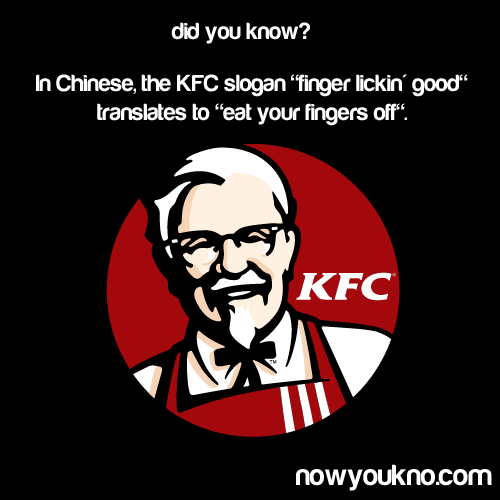 KFC decided to branch out into the Asian markets like many other companies have done before, and like many other companies, they did not do their research into how their slogan would be translated. 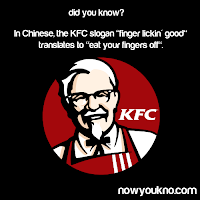 In 1985, KFC hit mainland China, bringing their slogan with them which is just as famous as the brand itself -"Finger licking good". Little did they know that when translated into Chinese lettering, their slogan would state "Eating your fingers off". Now this marketing mistake could have cost KFC millions of pounds just like Pepsi, but because of their brands strength, they succeeded in china after changing their slogan and proceeed to have over 900 outlets in China. Whether a business large or small (but most likely large) when moving into international waters, make sure that you pull our your new dictionary and get translating! Although the said companies managed to get away with their marketing mistakes, others may not be so lucky!